Robotic Palletising Cell for 15 kg boxes | PAK Automation Ltd.
Home / PAK Case Studies / Robotic Palletising Cell for 15 kg boxes. Lifting heavy packs presents a Health & Safety risk, palletising can raise other significant problems with employees claiming for injuries that could be avoided. The introduction of a Kawasaki palletising robot can not only reduce the Health & Safety risk but also improve your line efficiencies and produce a neater pallet. 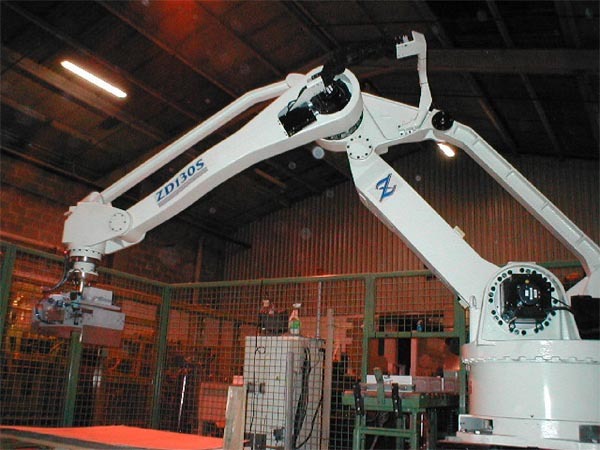 PAK Automation have recently completed the successful installation of a Kawasaki Four Axis Palletising Robot model ZD 130. The Kawasaki Robot in this cell is picking and placing 15kg packs from a conveyor and placing them onto one of two pallets. The cell configuration is such that the operator can enter and exit either side of the enclosure to remove one pallet while the second pallet is being built. The integrity of the safety in the cell is maintained by incorporating Sick light curtains, therefore allowing continuous free-flow of product. Estimated line efficiencies at this site will improve by 20% when the manufacturing process is modified and the output is increased. Part of the PAK Group, Automation & Robotics Irl exclusively incorporate Erwin Sick sensors, light curtains and bar code readers on all systems supplied. The Sick range of sensors offer security and piece of mind to employers, by incorporating Sick equipment you are guaranteed quality and many years of experience.